It’s nearly 10 pm, but I can’t let March 31st pass without writing a note on this immensely important moment in history. In 1492, Columbus sailed the ocean blue. And Fernando and Isabel issued the decree that sealed the death of the Golden Age of Spanish Jewry and changed the course of history for Sephardic Jews, Spain, the Mediterranean, and the world. So let’s see if I can give a rundown on this decisive day in less than a thousand words and less than twenty minutes. For almost a thousand years Christians and Muslims fought for the control of Iberia in the Reconquista (reconquest). Generation after generation, the Christian kings drove farther and farther south until Moorish control was confined to the southern region of Andalusía, and finally to their last stronghold: Granada. With the combined might of their newly allied kingdoms, Fernando and Isabel made the war on Granada their special project. After months of siege, the fight was over. The Moors surrendered Granada on January 2, 1492. Three short months later, Fernando and Isabel turned their attention to another thorn in the side of their united Catholic kingdoms: the Sephardic Jews. 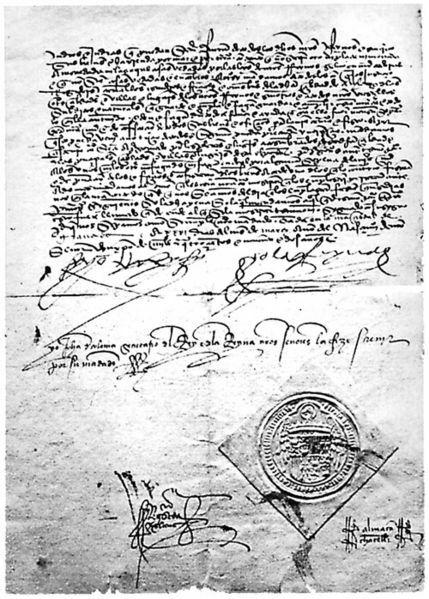 The persecution of Jews in Castile and León was not new; over a decade earlier the king and queen had obtained a Papal Bull to establish the Spanish Inquisition. It was not the first inquisition in Europe, but it was unlike anything that had preceded it, because instead of functioning as an arm of the Catholic Church, the Spanish Inquisition was under direct supervision of the monarchs, and it was the first national institution of united Castile and León. But what happened on March 31, 1492 surpassed any previous persecution and rocked the Sephardic world. Fernando and Isabel issued the Alhambra Decree, or the Expulsion Edict, that called for the expulsion of all Jews from the realms of Castile and León. Spain’s flourishing Sephardic population was left with three choices: leave the land where they had lived for more than a millennia, convert to Catholicism, or face death. Pope Alexander XI would later award Fernando and Isabel the title of “los reyes católicos,” or the Catholic monarchs, for their defending of the Catholic faith within their realms. But was it only religious piety or also politics and practicality that motivated the Expulsion Edict? After decades of warring with the Moors, the Castilian crown’s funds were all but depleted (tradition holds that Isabel pawned her own jewels to fund Columbus’ historic voyage). When the king and queen needed money to finish their campaign against Granada, they turned to wealthy Jewish merchant and financier families who had money to lend. Some historians argue that for the king and queen, it was easier to expel their creditors than to pay them all that was owed. Whatever the motivations, the edict forced an estimated 200,000 Sephardim to leave Spain and tens of thousands to convert to Catholicism on pain of death. Spain and the Sephardim would never be the same. This is the first post I have read but I can already tell I will like your blog.